If you are an adventure sports lover, then Malaysia is the ideal destination for you, for the country is equipped with plentiful opportunities for adrenaline raising, heart thumping recreational activity. One such seemingly mad scheme is base-jumping. 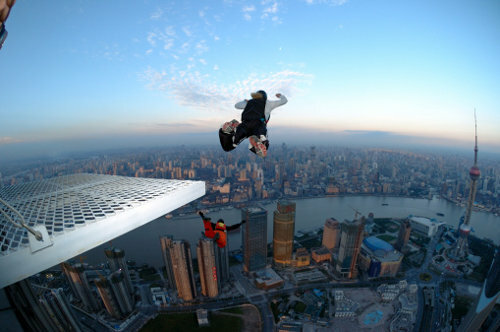 Base-jumping is a sport for daredevils and perhaps the slightly foolish, for it involves using a parachute to jump off towering, sky-high fixed objects. The term BASE is an acronym that stands for four categories of objects commonly used as ‘jump off’ points mainly Building, Antenna, Span(bridges) and Earth(cliffs). This somewhat foolhardy sport took root in Malaysia in 1999, when on Saturday, October 3rd 1999, three base jumpers, two Malaysians and a Canadian jumped off the broadcast tower of the popular landmark attraction in KL city, the Menara KL or KL tower. This base jump was an event staged for the Menara KL’s third anniversary celebrations but since then tall 421 meter (1381 feet) tall tower has become the site of the annual KL International Tower Jump, an event which attracts base-jumpers and fellow daredevils from round the world. The first KL International Tower Jump was held at Menara KL on 1st February 2001. Fifty pro and amateur base-jumpers from around the world took part in the event, which featured as a part of the Federal Territory Day celebrations. During the event, 434 base jumps were executed and Malaysia’s place as a host for base-jumping events was cemented, in fact the country became the first country in the world to host such a big base jumping event. The success of the inaugural base jumping event led to the inclusion of a second site for base jumping in Malaysia, the 166 meter (538 feet) tall Menara Alor Setar in Kedah in 2002since then bas-jumping events have be regularly held at the Menara KL. In 2006, Malaysia became the first country in the world to host a base jumping event at five different locales namely, Menara Tun Mustapha in Sabah, Menara Pelita, in Sarawak, Menara Alor Setar in Kedah, Menara Komtari in Penang and lastly at the Menara KL in Kuala Lumpur. The event was held over two weeks in August and attracted 68 base jumpers from round the world. They completed a total of 1880 base jumps during the event. This year the heart stopping but adrenaline-pumping event is scheduled for two days in September, from the 27th to 30th September. 2013. 100 base jumpers are expected to participate in this two-day high thrills and drama extravaganza. Applicants need to have completed 120 base jumps and moreover 20 of these base-jumps need to have been preformed during the last year. Additionally, they have to have been base-jumping actively for over two years. If you don’t meet the eligibility criteria, you have no reason to be disappointed for the organizers advise gaining the required experience and then trying again subsequently for base jumping off the Menara KL is here to stay.